Detailing the physical features, habits, territorial reach and other identifying qualities of the Broad-Headed Sharpshooter. 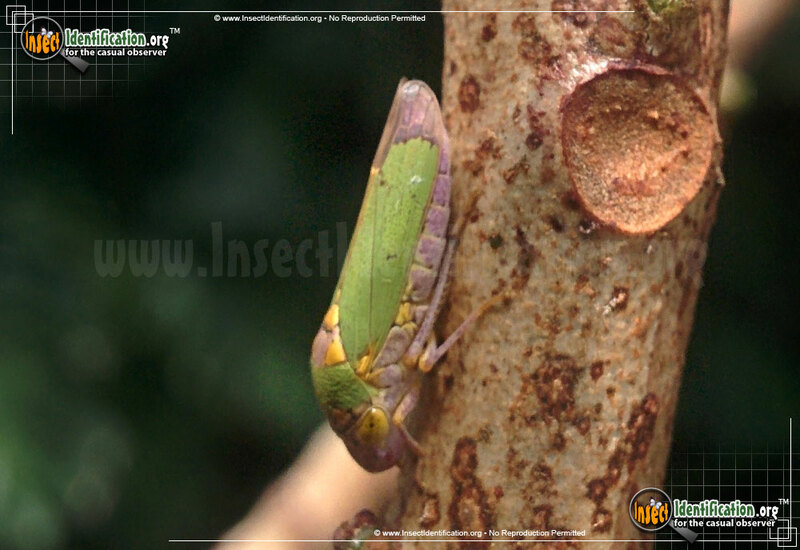 The vibrant Broad-Headed Sharpshooter is a type of Leafhopper that can always hits its target. The noggin of the Broad-Headed Sharpshooter is wide and bulky. It has the ability to leap far distances through the air as fast as a speeding bullet and land right where it means to. The green body and brown edges give it a leaf-like appearance. Some adults are a bright blue with yellow bumps near the head. All are eventually covered in dark speckles, giving their wings a worn appearance. Yellow eyes and patches near the head are useful for identification. This species of Leafhopper can fire out a stream of liquid waste at predators and threats, covering them in a mess. The distraction gives the Broad-Headed Sharpshooter time to escape. Females lay eggs on plant stems and cover them with a waxy-looking substance that she collects from her excretory system. This substance looks like a white spot on the side of her wing. It is believed to help keep the eggs moist and protect them from the elements and desiccation. This species feeds on plants and can be found in the warmer states of the U.S. and in Mexico.